Hissy’s a big boy! He’s more than 3m long and weighs 10kg. Recently, after owners Stahle and Tahlia forgot to close his tank before they went to bed, he was found curled up in the morning under paperwork in the office drawer. Just snoozing with a trail of destruction behind him. Things overturned and out of place. Hisssssss! Stahle says snakes are gentle creatures and are not to be feared. There were a few bites early on in their relationship, which Stahle says were entirely their fault, but other than that Hissy — who eats either a rabbit or extra-large rat once every six weeks — has only given them joy. He now hops on the bed and hangs on the couch with them. Wonder how big he’ll be then? Did you know that the Mornington Courthouse was the first public building and permanent courthouse on the Peninsula? Or that the masonry and stone lockup on the site was home to many an overnight drunkard and larcenist? This sweet little simply-gabled slate-roofed building must have been privy to some rough and ready characters. In continuous operation since 1860 and because of its position at the end of Main St, close to the pier where much of the freight and passengers originated, this cute yet pivotal piece of bricks and mortar history has probably heard it all. Think about it. All those tourists arriving at the pier right up until 1939, until the last paddle steamer stopped operating. Civil disputes. Breaking of by-laws. Gold being discovered in other parts of the state, resulting in Mornington providing produce and supplies to the rest of Melbourne. Everyone wanting to strike it rich. But there haven’t been any sightings of ghosts! Yet! Now an Information and Tourism Centre, the courthouse and lockup – which is managed by Victoria Police - are classified by the National Trust and have been included as “objects and sites of historic interest in the Mornington planning scheme and the former Shire of Mornington planning scheme”, as stated in the Northern Mornington Peninsula Tourism courthouse booklet. Built by William Vaughan & Co in 1860 and extended in 1862, the Mornington Courthouse serviced the whole of the Mornington Peninsula, while the lockup functioned as a jail from 1862 until 1882. As noted by the Mornington & District Historical Society on its website, “the court of petty sessions was held every Saturday at 12 noon”, as written in the Gazette on January 22, 1861, in Schnapper Point — now Mornington. One of the most infamous cases involved shire president John Blackner, who in 1919 was charged with forgery. The Northern Mornington Peninsula Tourism representatives now run mock trials for students, which may result in ‘wearing a ball and chain for five minutes assembling outside the lockup, plus one week of hard labour’. If you’ve heard any stories about what went on in the Mornington Courthouse or lockup, let us know. If only the walls could speak. Vibrant yet mellow, this year’s Pantone Colour of the Year is Living Coral. It embraces us with warmth and nourishment to provide comfort and buoyancy in our continually shifting environment. 2019 looks like getting brighter, more vibrant and just a little bit tropical. In reaction to the onslaught of digital technology and social media increasingly embedding into daily life, people are seeking authentic and immersive experiences that enable connection and intimacy. Sociable and spirited, the engaging nature of Pantone Living Coral welcomes and encourages lighthearted activity. Symbolising our innate need for optimism and joyful pursuits, Pantone Living Coral embodies our desire for playful expression. You will find fashion, homewares and artworks embracing this new colour. Representing the fusion of modern life, Pantone Living Coral is a nurturing colour that appears in our natural surroundings and at the same time displays a lively presence within social media. Pantone Living Coral emits the desired, familiar, and energising aspects of colour found in nature. In its glorious, yet unfortunately more elusive, display beneath the sea, this vivifying and effervescent colour mesmerises the eye and mind. Lying at the centre of our naturally vivid and chromatic ecosystem, Pantone Living Coral is evocative of how coral reefs provide shelter to a diverse kaleidoscope of colour. The Colour of the Year selection process requires thoughtful consideration and trend analysis. To arrive at the selection each year, Pantone’s colour experts at the Pantone Colour Institute comb the world looking for new colour influences. This can include the entertainment industry and films in production, travelling art collections and new artists, fashion, all areas of design, popular travel destinations, as well as new lifestyles, playstyles, and socio-economic conditions. Influences may also stem from new technologies, materials, textures, and effects that affect colour, relevant social media platforms and even upcoming sporting events that capture worldwide attention. The Pantone Colour Institute is the business unit within Pantone that highlights top seasonal runway colours, forecasts global colour trends, and advises companies on colour for product and brand visual identity. Through seasonal trend forecasts, colour psychology, and colour consulting, the Pantone Colour Institute partners with global brands to leverage the power, psychology and emotion of colour in their design strategy. Look out for trend-setters using this pretty new colour. Stephen sought medical treatment and was diagnosed with a Bairnsdale ulcer. Dr Peter Kelley says there has been a “massive” increase in Bairnsdale ulcer cases since 2015. Stephen didn’t contract the Bairnsdale ulcer while holiday in Scandinavia; rather, he suspects he got it while he was gardening, cleaning up possum poo in the backyard in Seaford. From January to October 2018 there were 295 cases, compared with 277 for the whole of 2017. It is still not clear exactly what causes the Bairnsdale ulcer, but the bacteria has been detected in mosquitoes, vegetation and possum poo. Dr Kelley has some simple advice on how to best protect yourself from the Bairnsdale ulcer. Carrum resident James ‘The Hammer’ Harding speaks to Kate Sears about his autobiography, Hard Cuddles, and how he turned his back on a life of drugs, violence and crime to become a mentor, public speaker and devoted dad. It’s tremendously humbling to be part of another human’s healing process. There is a huge amount of vulnerability involved in sharing emotional challenges with another human, so to be able to create a comfortable space for a client to share those experiences with me is amazing. Whatever is shareable is bearable, so with my mentoring process I removed all judgement a long time ago and have a tendency to look at a situation from the eyes of the person telling the story. Active listening with compassion and empathy is incredibly healing. Was your book challenging or cathartic to write? A little of both. I knew instinctively when I was writing that I was healing myself and I could feel a massive amount of residual emotion being cleared as I penned down every one of the 121,000 words in the book. Situations, stories and certain people would consistently run in my head very much like I wasn’t able to let them go. There was a real sense of releasing the pain, so certain chapters in the book had me in tears as I wrote them and I felt like I was being torn apart. I remember how hard certain moments were for me and I can’t help but feel happiness at the mountain I have climbed to get here. The book was actually written for me, no one else. I had no ambition of letting it go public. My sister snuck on to the computer and read a few chapters and demanded I send it to a publisher. Tell us about your public speaking? I love speaking publicly. I have spoken and held workshops at various councils, community centres and large organisations. Corrections Victoria has recently contacted me to start organising a program for the inmates in prison. That particular presentation is something I hold very close to my heart. If things had’ve gone a bit differently for me I could very well have been listening to the presentations as one of the inmates. Ultimately, public speaking is a beautiful way of connecting with other human beings. It’s a massive energy transference. I give so much of myself and in turn receive a lot of energy back from the audience. It’s a very special feeling. What do your love about our community? I volunteer at the Pantry 5000 and the Bonbeach Football Club as a welfare manager under the tutelage of magnificent Matty Lowe, the president and director of Lowe Constructions. Specifically, during my time of darkness I promised myself that when I found some balance and peace I would do everything in my powers to help other people. To me it makes a lot of sense to raise all of my children in a fashion that allows them to see that what their father does is normal, so in a lot of ways raising five caring and community-minded children is my greatest legacy and contribution to the universe. Women’s cricket is nothing new. 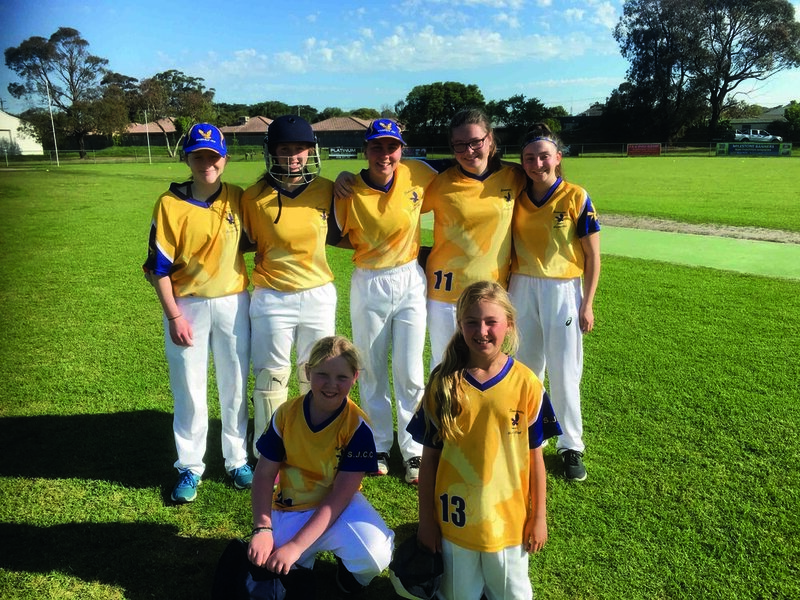 The Frankston Women’s Cricket Club pioneered the game on the Peninsula more than 40 years ago, there were 14 teams playing in the Mornington Peninsula Cricket Association girls’ cricket competition last year and this year the girls hit the crease again with bats blazing. Kim Jackson is a general board member of the MPCA and director of girls’ cricket and gives us the ‘goss’ on why this traditionally male-dominated sport has got girls between the ages of 10 and 15 on the go. Whether off-side or leg-side, the nine teams that begin their second season after Christmas are keen, clean and ready to strike. There are currently eight clubs on the Peninsula with girls’ teams: Baxter, Carrum, Carrum Downs, Heatherhill, Long Island, Mornington, Pines and Somerville. Games are played on Tuesdays from 5-7.30pm and the clubs are always looking for more players. Kim suggests dropping by your local cricket club if you want to start a girls’ team. It only takes one inquiry to get the ball bowling. “Girls’ cricket has a two-fold purpose. One, we want to give girls a pathway to elite sport, and two, we want to get girls moving and making social contacts. Girls love getting together with each other and cricket is a great way of doing that. My father (Colin Bowes) used to be on the MPCA board and really pushed the girls’ cricket contingent. Now I intend to do the same.” There are many clubs and individuals working together with a very supportive MPCA board and Cricket Victoria to develop not just ‘girls playing cricket’ but ‘cricket players’. The second season of the MPCA girls’ cricket competition runs through January, February and March. Get cracking on giving them the support they deserve and let’s hit a few sixes for girls’ cricket. Have you ever tried to make your way through the day in a world of groggy and foggy fatigue? Or felt so off balance and under the skin boiling and brain-numbing blurry that all you want to do is curl up on the couch with a cup of tea and stare at a blank screen? Well, Sue Bugeja has. Living with multiple sclerosis has changed this 49-year-old Mount Martha resident’s life dramatically. First diagnosed with optical neuritis and sent along to an eye specialist where the tests were inconclusive, Sue had been feeling exhausted, off-balance and weak for some time. But there were two young children to chase, a home to look after and a job that demanded attention. Surely everyone in the same situation felt that tired. But her body and mind felt strange. Her eyes were playing funny buggers and sometimes she felt so hot she thought she’d slipped on 20 shag-pile sweaters without knowing it. She explains. There she is. Red lips, wide smile and tattoos that splash over her milky skin, their forms moving in vibrant colours. Perched on a stool on a balcony overlooking the water, hair pulled back with a scarf wrapped around her head, Esther Yann is picture pin-up perfect. She’s 24. She’s curvaceous. She’s on her way to becoming a criminologist. And she’s tired. Working as a burlesque performer in Melbourne two nights a week, studying criminology at Deakin University and working a daytime job keeps her busy. Then there’s the love of her life, musician Jackson — her husband to be — and her cats and bearded dragon Haku to hang out with. We’ve never met before, but this beautifully fragile yet tough, determined and compassionate young woman is easy to talk with over a glass of vino. “I was always going to do something in the arts and performance sector. Or work with animals. The problem is I have dyscalculia. I can’t work out mathematical equations and I can’t read big numbers. I can’t even read the time. It’s the equivalent of dyslexia but instead of having problems with words, I have problems with numbers. People at school always thought I was dumb. 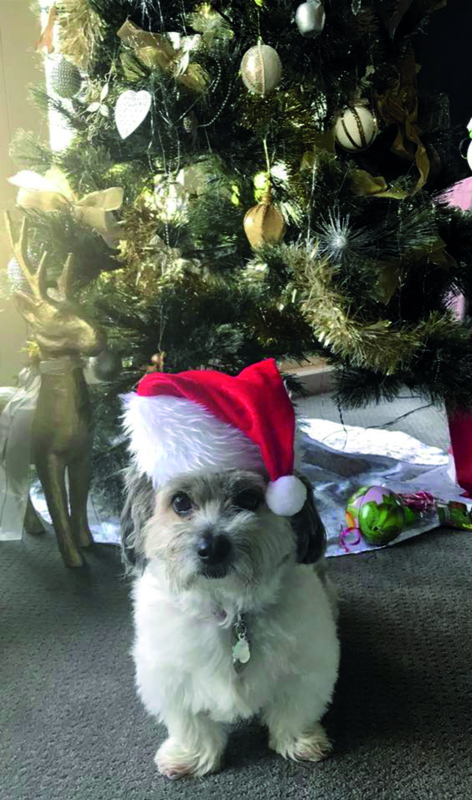 I wanted to be a vet nurse and worked in three different vet clinics in Sydney before moving back to Melbourne, but it was too hard and I became depressed. I acted for a while — even had a big audition for a movie with Toni Collette. I got down to the last two for the role and didn’t get it. I thought, this doesn’t feel great. Maybe acting is not for me,” she explains. Esther has a turbulent past. Growing up on the Peninsula with her sister and parents, family heartache and terror snuck into her world one day when she wasn’t looking and left its indelible mark burning through to her core. She is the daughter of Jeff Yann, whose mother was murdered in their lounge room (see July’s Mornington Peninsula Magazine). This has shaped her life and is the reason she’s set on becoming a criminologist, although she has always been interested in the psyche of serial killers and what motivates people to perpetuate and repeat crimes. Watch out for this survivor’s future gig working with a correspondent from The Australian newspaper who will be presenting a podcast about her grandmother’s case. Esther will bring the family’s perspective. “I’m excited to be working on this,” she concludes. Dance, Pistolina, dance. The strength is within. Ellen Marion Bromley was some kind of glamorous, outspoken, creative and brave babe. The running joke is that her husband, Alan McLeod McCulloch, only married her in 1947 because she had a typewriter! That’s what her daughter Susan McCulloch and granddaughter Emily McCulloch Childs say as we chuckle over the possibility. They met when both were working in the Commonwealth Bank in the 1930s. Alan became a writer for the Argus, the Australasian Post and much later an art critic for the Melbourne Herald for 30 years. In New York he crafted her wedding ring out of cigarette paper and wire, which Susan and Emily treasure. “I’d much prefer being given this instead of some huge diamond ring,” says Emily as she opens the pink velvet box where this delicate organic sculpture lies. “I just love jewellery. I mean, look at that!” We both sigh as the light drifts through the large windows into this wonderful Whistlewood space in Shoreham surrounded by books and art. The home was left to both of them by Ellen, who bought it herself. Hard to imagine when you know from where this stylish beauty came, but this smart bird had entrepreneurial instincts, the guts to pursue them and the grunt to see her vision through to fruition where others may have failed. Emily joins in. “She always had her piano. I think she moved around 20 times and she always took her piano with her.” Much laughter falls between us and on to the table to caress the photos full of love, laughter, bike-riding and ladies’ lunches in all their visual glory spread out before us. “She also loved feminist and Australian literature, which she introduced to me,” says Emily. “I had two sets of godparents — Dorothy and Oscar Hammerstein and war correspondent William Winter. Mum was an adventurer and had a strong belief in equality for all. She loved anything to do with culture,” Susan concludes. The gift she’s passed on to the two remaining generations of determined McCulloch ladies making their way in the world from deep within Whistlewood. Surf’s up again on Saturday, January 12, and Saturday, March 16, at Point Leo for all you surfers out there who need just a little bit of help getting in and out of the water. The Mornington Peninsula branch of the Disabled Surfers Association is putting together its well-loved annual event where people who have a disability come together to laugh, get wet and of course surf with the help of a dedicated bunch of volunteers who bring their might, humour and good vibes with them. This year’s beach access will be better than ever with a fully-functioning wheelchair-friendly boardwalk up and ready for action. Launched last May, the 82m structure, viewing platform and ramp down to the beach is made of tough fibreglass and timber and makes life easier for DSAMP volunteers to deliver surfers back to the change rooms. This means no more navigating the dune from the beach, which puts smiles on everyone’s dials. DSAMP, the Point Leo Foreshore Committee and the Point Leo Surf Life Saving Club were involved in the project. If you’d like to volunteer at an event that changes people’s lives, follow this team of innovative and empathetic movers and shakers on Facebook @letsgosurfing or email [email protected] to register your interest. 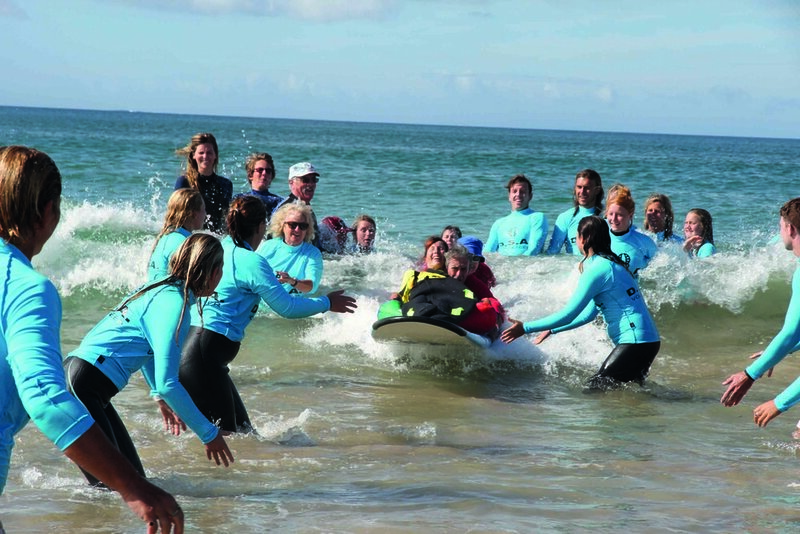 Aiming to “provide a safe and enjoyable surfing experience for all disabled surfers and unite the local community”, DSAMP brings the best out of people helping people who need help. It’s been doing that since 2011. A young Hawk and his hero — Cebby meets Hawthorn legend Cyril Rioli last year. It is good to be home. Our lives changed for ever on August 10, 2018. It was a fairly normal day. I had dropped Cebby off to school that morning. I had the flu and so was under blankets on the sofa watching the movie The Cup, about jockey Damien Oliver. In the movie Damien’s brother has just fallen and died. I am sobbing just as Cebby’s school calls. “There’s been an accident,” she says. “Paramedics are here. We are not sure what has happened. The principal is heading over there now.” I grab my nearest shoes and drive to the school, fast. The elation’s obvious as Tanya and Cebby leave the Royal Children’s Hospital after 120 days. Nearing the school it is obvious where I need to go. There are fire trucks, police, paramedics and ambulances. I sprint past them all towards a big shed. When I get there I see Cebby. He is lying on the concrete shirtless. His school shoes are still on his feet and they don’t move. Paramedics are working on him. He is breathing, they say. No, I’m not allowed to hold his hand. I look up at the 6m skylight he fell through at lunchtime. It is high, really high. I worry he has broken his neck or back. A policeman drives me to the oval where a chopper is waiting. I take my seat and then Cebby is carefully placed in front of me. It is a sunny day. The chopper lands at the Royal Children’s Hospital and we make our arrival through the roof. Nurses and surgeons are yelling, running, rushing, kind of like on TV. I’m ushered to a small room and a tiny woman — the brain surgeon who will operate — talks calmly. She says what has happened to Cebby and what they will do in the operation and what might happen. I hear words like “severe”, “bleeding in the brain”, “he might not survive”. She is calm and emotionless while talking. I am not calm. I can tell I am not calm because people are holding down my arms. Someone is making weird, loud noises and I realise it’s me. Then a social worker who talks too fast takes me to a room where I wait for hours. Cebby is swollen beyond recognition. There are tubes in his mouth, up his nose, in his arms. His head has a bandage on it that says “no bone”. The room is full of machinery all attached to Ceb. I learn quickly what each machine does and what each alarm sounds like. There is a Codman in his brain that measures brain swelling. The monitor that detects the swelling levels dominates my days for weeks. A nurse gives me a date and says if he reaches this day he should survive. “You look like a puffer fish, Ceb,” she says gently. The nurses tell me it’s 5am and I should get some sleep. I look at them like they are insane. But eventually I go, and then come back at 6am. “You are in hell right now,” a nurse tells me. I appreciate her honesty and imagine a doormat at the ward entry that says, “Welcome to hell”. Five days later Cebby turns 14 while he is in a coma. At 7am I imagine him unwrapping his present at home — a beautiful blue surfboard. The days go fast and slow at the same time. Mel, one of his ICU nurses, calls Cebby “miracle boy”. But most call him “the ninja” because he constantly pulls off his ECG dots, IV drip and nasal gastric tube. His hands are bandaged but this doesn’t stop him. He uses his teeth to unravel the bandages. A pile of bandages is often left on his chest within seconds. The bandages look like boxing wraps and in his half-sleep he knows this and constantly spars the air above him. Cebby still plans to ride the surfboard he got for his 14th birthday. A week later he has his second operation to fix the many fractures in his face and eye socket and put his skull back on. “Cebby can’t see,” he said to me one day. There has been no crying or anger. There have been milestones fought and won. He is learning to navigate the world in the dark and is doing so with his typical humour and wisdom. There are many battles ahead to be fought but the one thing I know is Cebby will keep on punching. Thank you to our wonderful community that has shown kindness and love. Special thanks to Mornington Peninsula Foundation, Bahas in Rye and Karen Catalucci Boxing for holding fundraisers; Jodie Hornsby for setting up the Go Fund Me page even when I said no; Cheryl Beattie from the Music Industry for writing a song about Cebby and giving the gift of a music scholarship; Jasmine Murray for checking in daily on our bird, Keats; the students at Dromana Secondary College who busked and baked to raise money for Ceb; my parents for looking after Early, our beloved kelpie; my brother for his love and support; our wonderful neighbours, Geoff and Linda, and my dear friend Tammy whose many visits to the hospital kept me nourished and sane. If Birte Moliere was a colour, she would be green, or perhaps blue. Growing up in Germany and now residing in Frankston South, this conservationist, tourism professional, sustainability coach and mother of two boys is “determined to leave the planet in the best shape possible for generations to come”. That’s why she’s the founder of beach cleans, zero-waste and sustainable business initiatives. She explains. Birte Moliere with her husband, Darryl, and their two children, Max and Henri. Birte, her husband Darryl and their two children Max and Henri are outdoors people. Hiking. Biking. Beaching. Living their lives as sustainably as possible. Birte brings years of experience and education to the environmental platform. She has a Masters in Sustainable Destination Management and Majors in geography, marketing, development, market research and business from the University of Paderborn, Germany. 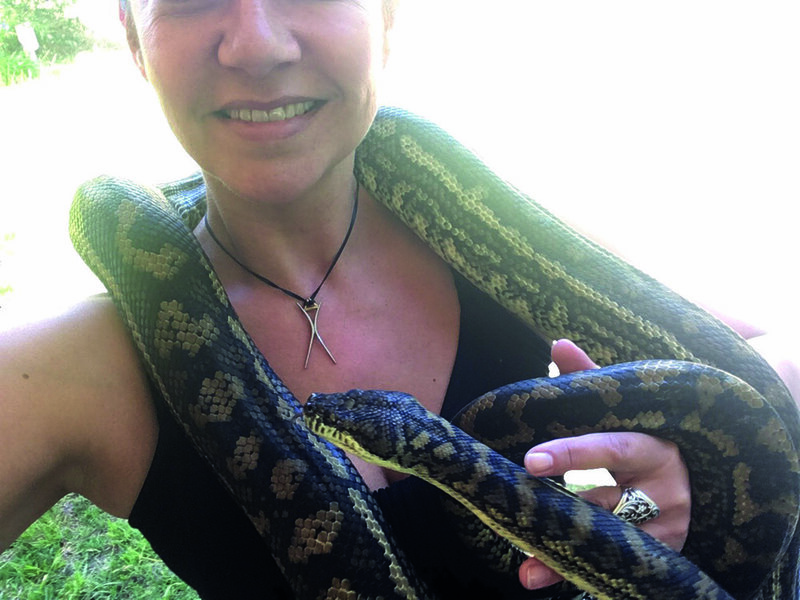 She also has a Bachelor of Technology with first class honours in Ecotourism from Flinders University, Adelaide — so she’s got the knowledge to bring about true environmental change on a local level. She continues. Back on the Peninsula, Birte oversees Mount Eliza beach cleans under the Beach Patrol Australia umbrella on the last Sunday of each month. “It has been well-received since we began in 2018. We have around 400 active members on our social media platforms and people from all walks of life including many families come and help at different times. It doesn’t take long and makes a real difference,” she continues. Check out Mt Eliza Plastic Free at mtelizaplasticfree on Facebook to become part of a community forum that ‘encourages, educates and celebrates improved resource use and works toward zero single plastic bag use’. If you would like advice on how to further your sustainability journey in 2019, give Birte a call on 0478 597 373 to see how you can colour your world with green. Or blue. The largest shopping centre on the Mornington Peninsula, Bayside Centre attracts an average of 1.5 million people each December alone. This year, members of the community have been invited to spread the spirit of Christmas in the centre through the use of art therapy. 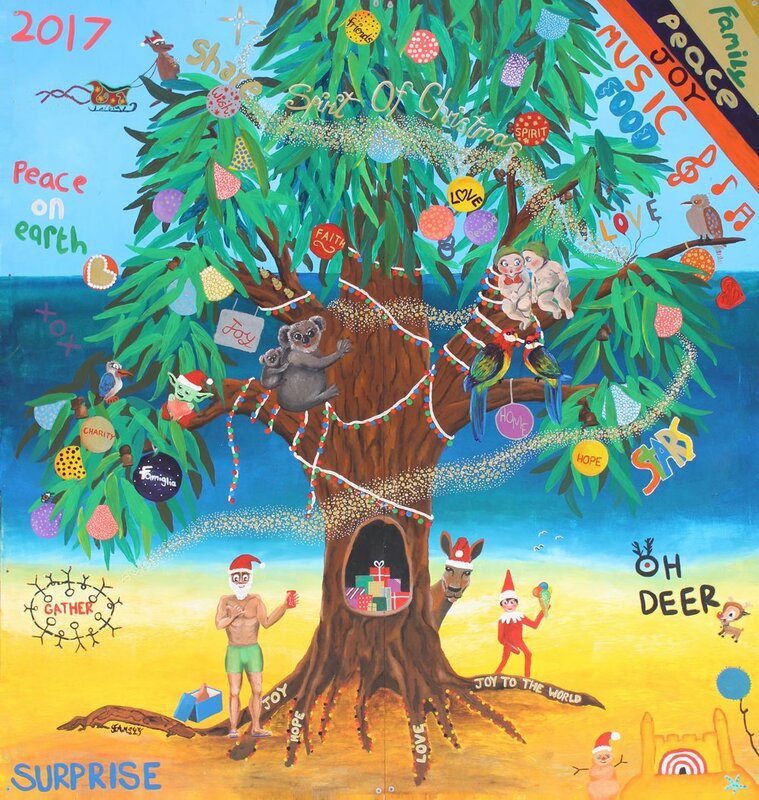 A bespoke piece of artwork, created by students from the Brotherhood of St Laurence’s Transition to Work program, will be on display in the centre throughout December. Students have begun work at Kindred Art Space in Frankston, a unique art space and centre dedicated to mental health and well-being. The process invites collaboration and encourages students to take part in art therapy sessions where creativity is allowed to be exercised freely in a nurturing environment. The artwork will reflect the students’ creative ideas and perception of Christmas in our community and will be on display on Level 2 of the centre. To stay up to date with the installation, visit the centre’s webpage, Facebook page or Instagram. There’s Never-Never been a better time to visit Boneo Maze — the new home of Sand Sculpting Australia on the Peninsula — with the summer opening of Peter Pan. The classic tale of the little boy who never grew up is being reimagined in 3500 tonnes of sand by 15 award-winning Australian and international sand sculptors along the wetlands and garden pathways of Boneo Maze. With several sculptures standing up to 4m high, Peter Pan will be flanked by Captain Hook and Mr Smee, the Lost Boys of Never-Never Land, Tinkerbell, Indians, mermaids and the tick-tock crocodile, with secret hideouts, swashbuckling adventures and feisty fairies bringing this children’s favourite to life. One of the sculptors, Joris Kivits from the Netherlands, estimates it will take 5000 hours to create the artworks. The move to Boneo Maze is a return home to the southern Peninsula for Sand Sculpting Australia, which was launched in Rye 11 years ago by the Wittingslow family. 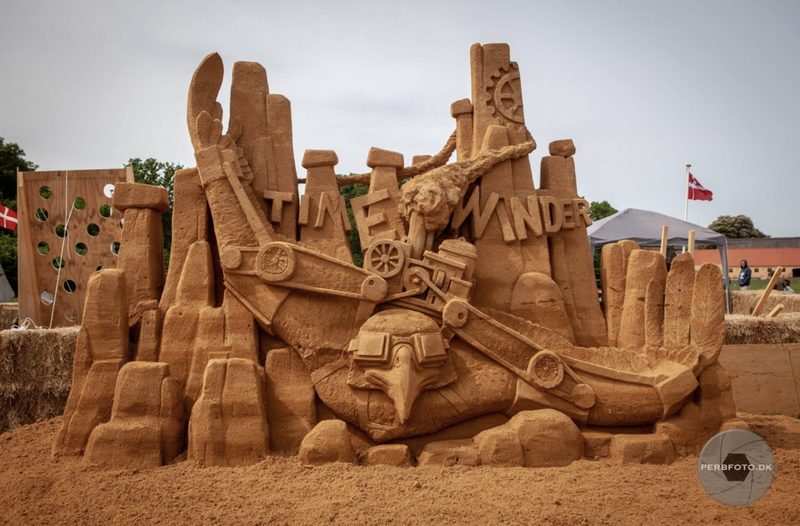 Since 2004, Sand Sculpting Australia has gone on to present 19 major sand sculpting events enjoyed by more than 2.2 million people across Australia. Sand Sculpting Australia at Boneo Maze opens on Saturday, December 15, from 10am-5pm then daily from 10am-6pm until Monday, January 28 (closed Christmas Day). For ticket prices and more information, visit sandsculpting.com.au or phone 5988 6385. I met Sarsha Pancic a while back when covering a story on the Hurley surf clinic at Gunnamatta for Mornington Peninsula Magazine. The breaks were fierce that day as this tiny Blairgowrie bombshell lunged and squatted head-first into the eye of the churning waves without fear. Fast-forward and our paths have crossed again as this self-described “salty-haired grom” continues to grow and get better at what she loves to do most — surf. With dreams of becoming a pro surfer like Sally Fitzgibbons or Stephanie Gilmore and travelling the world to “awesome places like the World Surfing League surf ranch in the States, France, Fiji and the Maldives”, this svelte 12-year-old has the surfing world at her strong and capable feet. She’s ready. Just watch her flow. “I grew up surfing in Western Port Bay and Point Leo with my family. Now I love surfing at local breaks and Jan Juc on the west coast. I’m a member of the Torquay Boardriders Club and was under-12 girls’ champion last year. I also do gymnastics. I want to qualify for the Victorian Junior Surfing team and represent Victoria at the Australian Junior Surfing Titles,” she explains. Why not? She already competes in the national Rip Curl Grom Search, which is a series of events designed to find the most talented surfing grommets across the globe. This competition runs in 10 countries and has more than 5000 competitors worldwide. In 2018 Sarsha gained impressive results across three of the five events held so far, coming third twice and winning the event on the Yorke Peninsula in South Australia in the 12 and under girls. This means she’s secured a spot at the national final, which will be held in January near Wollongong. She continues. “I love connecting to nature and surfing with my family and friends. I want to keep learning and improving and am lucky to have the support from people who are close to me, like my dad, brother, uncle and grandfather.” Torquay Boardriders Club president and Surfing Victoria high-performance coaching director Cahill-Bell Warren, Bass Surfboards owner Craig Watson, Balin Surfers Hardware owner Jon Wilson and surfer Nick Wallace are all on board too, making sure she gets the direction she needs to achieve her dreams. Watch this space. This hot chip-loving tween who reckons it would be ace to be a bird is ready to spread her wings and surf the line. I’d heard about Boon Wurrung author N’arweet (elder) Carolyn Briggs. Heard she was tough, direct and opinionated. When I first met her at a book signing in Sorrento many moons ago, her cool inner-Melbourne chic, cropped coloured hair, smart bright eyes and highly held head seemed to support the murmurings. She spoke with a voice of generations and a deep connection to land and ancestors. Here’s a snippet of her devotion to living her people’s story. Who are the Boon Wurrung people? The first people of the bays (Port Philip and Western Port) and southeast Victoria. In Melbourne. There was a strong Kulin community in North Melbourne, where my mother lived. When I was young, we moved to Swan Hill, to my maternal grandmother’s Country. Her name was Margaret Taylor and her family were Wemba Wemba. My grandfather, William Briggs, was known as Napa, a Kulin word meaning ‘grandfather’. He was a very proud and respected man. Bundjil was a deity of the Boon Wurrung. He travelled as an eagle and protected the land and the children of the land. Bundjil was also the creator, and many of the traditional stories of Bundjil relate to both the creation of the people and the protection of the people from harm. Tell us about your great-grandmother, Louisa Briggs. Louisa was born into the Yaluk-ut Weelam clan of the Boon Wurrung language group around 1835 and lived until 1924. Louisa with her mother, aunt and grandmother were taken by sealers to Bass Strait to work as slaves — catching seals, processing their skins and rendering their oil. They travelled by open boat between the islands of Bass Strait and Melbourne. She was a matriarch and an activist who supported her children and made them strong. She sent many letters to the Aborigines Protection Board. Two of Louisa’s children gave evidence at the Royal Commission in the 1880s. She died aged 90 at Cumeroogunga. What did the Port Phillip region look like thousands of years ago? Much of the area we live on today was very different prior to the Europeans arriving. The land supported a complex ecosystem, with many creeks and swamps supporting a wide range of life. For example, the eels (iilk) would travel up through the creeks and rivers, and this provided a great source of food during particular seasons. These were farmed through fish traps and often smoked in large hollow trees to preserve them. I have seen some of these remaining sites on the Mornington Peninsula. What is the Boon Wurrung Foundation? The Boon Wurrung Foundation was established in 2005 so we could ensure the survival of the Boon Wurrung cultural heritage that had been passed down and to promote this unique part of Melbourne’s history. What does being a keeper of the history and genealogies mean? In our community, the history has been traditionally protected by the women who kept the knowledge of family and genealogies. This knowledge is the most important part of our heritage and it contains the stories of our families. How does Boon Wurrung language differ between written and oral forms? The first attempt to write the Boon Wurrung language occurred in the late 1830s by William Thomas, the assistant protector of Aborigines. He began translating the Bible and the Lord’s Prayer as well as some of the psalms into Boon Wurrung. William Thomas understood and respected the structure and hierarchy of traditional Yaluk-ut Weelam society. In recognition of his commitment towards the traditional owners, he was given the title Marminata, which translated means ‘the good father’. His diaries remain an important record of the Yaluk-ut Weelam. My children and other young people making some amazing achievements. When I see them happy, confident and achieving their own goals, I know the journey has been worthwhile. Gaps. Space where someone once was. How do you tell a child that their father isn’t coming home and guide them with what to do with that empty space in a way that best serves them? How do you process your own well of emotions, let alone navigate a path for your children to follow? The book is filled with openness and empowers readers to communicate feelings and build effective resilience strategies. It has had great support from both the cancer and grief sectors. It is recommended in the Cancer Council’s Cancer in the School Community booklet and highly recommended by Magpies Magazine in 2017. Four years on and now living in Torquay, Tracey sees her tight-knit family’s future moving forward. If you are living a similar story, you can go online at intherainbow.com.au to purchase a copy of this lovely soft-cover book that tells it like it is in a safe and gentle way. In the Rainbow makes annual donations to the RMH Neuroscience Foundation for brain cancer research (neuroscience.org.au) and the Wes Crooke Scholarship/Endowment Fund in conjunction with PANGEA Global Health Education, to support the training of medical professionals in Africa.